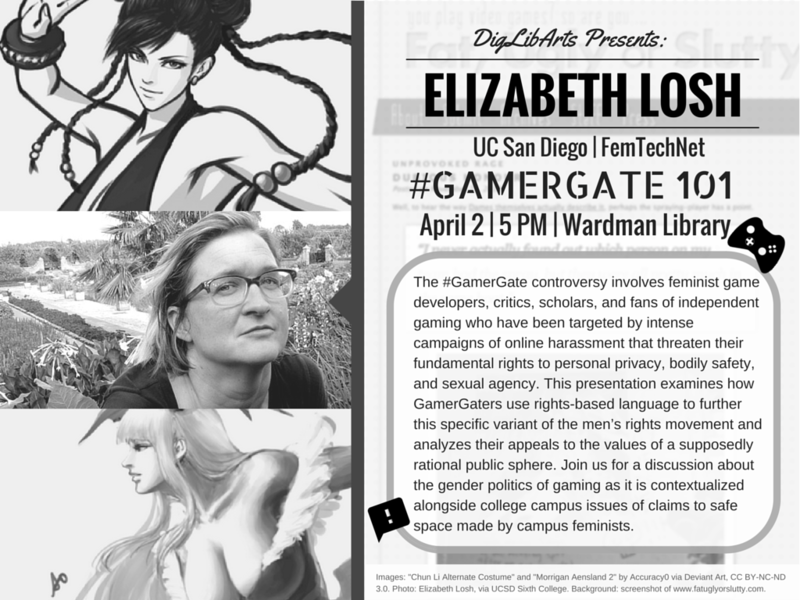 DigLibArts is excited to host Elizabeth Losh (UCSD, FemTechNet) for a talk and discussion about #GamerGate, gender, and safe spaces. The basic narrative of the #GamerGate controversy involves feminist game developers, critics, scholars, and fans of independent gaming who have been targeted by very intense campaigns of online harassment that threaten their fundamental rights to personal privacy, bodily safety, and sexual agency. It is important for the eloquent first-person testimony of the women themselves to be given priority as speech acts that command attention as forms of resisting to prevailing misogyny, but it also may be useful to examine the larger discursive context of #GamerGate and why hard-core gamers who are fans of AAA videogames with military storylines and first-person shooter game mechanics have constructed a seemingly illogical and paranoid explanatory theory about so-called “social justice warriors” pursuing unfair advantage. How do we understand their claims for noninterference and sovereignty in game worlds? This presentation examines how GamerGaters use rights-based language to further this specific variant of the men’s rights movement and analyzes their appeals to the values of a supposedly rational public sphere. As they deny the materiality, affect, embodiment, labor, and situatedness of new media, they also affirm positive notions about the exceptionalism of a realm defined – in Nicholas Negroponte’s terms – by bits rather than atoms. Of course, decades before #GamerGate, Dutch game theorist Johan Huizinga described what he called the “magic circle” of the temporary world constituted by a game, which functions as an isolated “consecrated spot” within which “special rules obtain” for performance of “an act apart” from everyday concerns. According to Edward Castronova, the protective membrane around game space “can be considered a shield of sorts, protecting the fantasy world from the outside world.” At the same time, how do we understand the competing claims to safe space made by campus feminists, which have sometimes been ridiculed by critics of trigger warnings and depicted as a situation of being “in college and hiding from scary ideas”? This presentation situates the failure of Anita Sarkeesian to speak at a public forum at Utah State University in terms of these larger debates. Elizabeth Losh is the Director of Academic Programs at UC San Diego’s Sixth College, and Professor of Rhetoric and . She studies media history, institutions as digital content-creators, the discourses of the “virtual state,” the media literacy of policy makers and authority figures, online political activism for human rights, electronic art that uses hacktivism, and the rhetoric surrounding regulatory attempts to limit everyday digital practices. She has published articles about digital literacy, citizen journalism, videogames for the military and emergency first-responders, government websites and YouTube channels, state-funded distance learning efforts, national digital libraries, political blogging, congressional hearings on the Internet, and the role of gender and sexuality in technoculture.